I am writing this specifically for Jonathan and Brad. This was one of the finest finds for me in the personal finance space and I want the community to take advantage of it ASAP. In my other posts Simplifying saving for college and How to get your money into Roth IRA even when IRS prohibits it? , I talk a lot about how to get more money into Roth IRA. This is especially very important for the people who have already maxed out all pretax contribution opportunities like pretax 401K, HSA etc. This is the last post in the series. $3400 in HSA ($6750 for married filing jointly). Also maximize other pretax vehicles if at your disposal. After doing all the above things, if you still have money leftover to invest, please don’t invest it in a taxable account. Instead, invest it in Roth IRA via the Mega Roth because Roth IRA has some major advantages. (see Simplifying saving for college). A Traditional 401K has a contribution limit of $54,000 (first surprise! most people think it is $18,000). Here are the usual ways money goes into your 401K. Your pretax contribution- $18000 limit in 2017. Your employer’s matching- different companies have different rules. Your after-tax contribution (let’s call it ATC). ATC is where the magic happens. In a hypothetical example for Mr. Kirti, here is the breakup. Mr. Kirti contributes $18,000 of his pretax income to 401K. Mr. Kirti makes another $27,000 ($54,000- $18,000- $9,000) of ATC. What happens to the 27K worth of ATC? It can be left there till retirement. Not very advantageous because money does not grow tax-free (unlike Roth IRA). 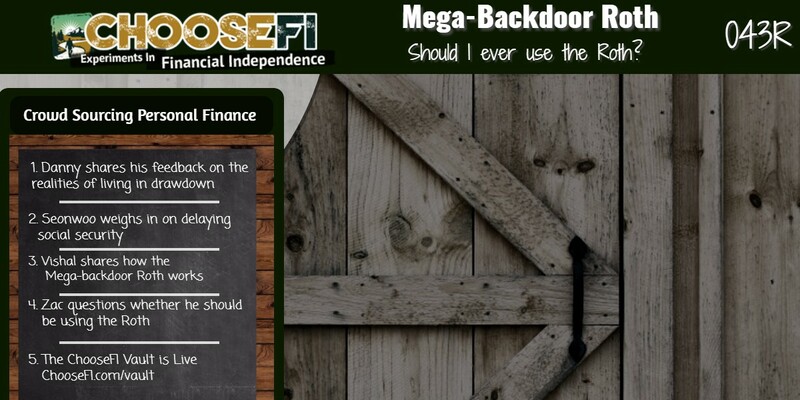 Can we rolled over into Roth IRA called the Mega Backdoor into Roth. Can I do this as well just like Mr. Kirti? Not everyone’s employer’s 401K allows this. Your plan needs to allow something called In-Service distribution since you are still working at the company. Mr. Kirti’s 401K administrator allows him to take one In-service distribution every 12 months. But your plan might have different rules. How should I go about doing this? Call your 401K provider and ask them about In-service distribution. If they allow it, go to the next step. Ask them the number of such distributions allowed and any costs associated with it. If any number of such distributions are allowed without any costs, take these distributions after every paycheck. You will most likely get a check for “<company which holds your Roth IRA> for the benefit of <your name>”. If they allow only one such distribution every 12 months, then try to make your after-tax contributions into the 401K in a shorter interval of time. Eg. make ATCs around bonus time or make the maximum allowed (% of your paycheck) ATC for some consecutive number of paychecks till you reach the max cap. The reason it is important to cluster it in such a way is because your contributions might grow if left in the 401K account for long and you have to understand what happens to the growth. So, what happens to the growth? First, you decide if you want to have growth or not while your money is sitting in 401K, waiting to be rolled over to Roth IRA. You need to decide because the growth can lead to a taxable event (it matters when you are trying to keep your Modified Adjusted Gross Income-MAGI within a certain level). Mr. Kirti likes to let it grow since in his case, “growth minus taxes” is still superior than “no growth and no taxes” because he cannot possibly benefit very much by keeping his MAGI low by relinquishing real growth since he won’t be eligible for any benefits anytime soon. If you don’t want it to grow, just put it in a Settlement account (usually money market) in the 401K and when the roll over into Roth happens, there is no taxable event. If you invested it in the stock market, it might have grown. Now you decide how you want to handle the growth. Take it to Roth IRA: Taxable event- you pay the taxes on the growth portion that year. Move the growth/earnings portion into Traditional IRA: this makes sense for people who never intend to do the regular Backdoor Roth because if and when they do the regular Backdoor Roth, they will have a big taxable event. If you intend to separate out the In-service distribution between contributions and growth, make sure you know the respective amounts (your 401K provider tracks the cost basis of the ATCs). That’s it. If you have any more questions, ping me via the blog or pester Brad and Jonathan. Let me know how it goes for you and feel free to provide constructive feedback. Happy investing! ← How to get your money into Roth IRA even when IRS prohibits it? Question for you, does the roth have to be a 401K roth or a Roth IRA? It can be either but Roth IRA has more advantages. The principal (contribution) to a Roth IRA even post a conversion are available in 5 years from the date of conversion, free from penalty and taxes. However, for a Roth 401K, there are two problems (1) Penalty (2) Any withdrawal is assumed to be in the same ratio of contributions and earnings as is the ratio of total contributions and total earnings in your Roth 401K. This leads to taxes since withdrawing earnings before 591/2 years of age from a retirement account is taxable. I should have moved the ATCs out earlier, but I can’t turn back time now. What if I roll over that loot to a Roth? I figure I could roll $32k into a Roth IRA and the remaining $17k would end up in a traditional IRA (that’s fully taxable as ordinary income when I withdraw). Or can I leave the $17k in the 401k as ATC with a zero cost basis? I would prefer to keep that money in the 401k because I have access to zero-cost index funds (subsidized by my company). Or even if the $17k end up in a Rollover IRA at Fidelity, I figure I could roll it back again to the 401k, right? I could kick myself that I didn’t do this earlier but that’s what I’m dealing with now. Thanks for the comment. I thoroughly enjoyed your episode on Brad and Jonathan’s podcast. Here are a few thoughts. 1) Unfortunately, you cannot leave the earnings of $17K in your 401K since IRS does not allow that anymore. 2)You have to take it with you. But where? a)A Traditional IRA. – You park the 17K there (pretax). But remember, if in the present year, if you do the traditional backdoor Roth (converting post-tax traditional IRA contributions to Roth IRA since your income is very high, this will lead to a taxable event). Hence if you are going with a), skip the conventional backdoor Roth. b)Roth IRA- Pay the taxes on 17K in the present year.b) does not need more explanation. i)You do a Roth conversion ladder and slowly move it to Roth during your low income years (hence not paying taxes). ii)If you leave it in IRA and if you are are already close to 59.5 years of age, just withdraw it in the low income years of retirement so that you don’t have any tax consequences. ii) is only preferable if you are close to 59.5 since i) makes the money more flexible. iii)Roll it back to your 401K- Reverse Roll-over. Check with your plan if it allows it. Also, I checked with my plan for 2)a)iii) and they allow as many Roll-ins as you want. Hence, this seems to be a good option to keep earnings/growth as tax deferred. Found your article via the chooseFI podcast. Thanks a lot for writing this. I have just started doing this since the middle of the year and recently moved over the contribution to Roth and the gains (just a small gain around $160 or so) to a rollover IRA (this is what was suggested by Fidelity) so that it does not get taxed till I access it. I also have been doing the regular backdoor Roth for couple of years and have already done it for this year for the full amount $5,500 I think. The question is, what can be done to remedy this, because I really like the simplicity of having the regular backdoor Roth as a non-taxable event. Can I now move over the small gains over from the rollover IRA (which just contains $160) to Roth and pay the tax for it, thereby leaving the regular Roth as a non-taxable event? Also come to think about this, I have now added $5500 + $160 to my regular IRA for this year (max allowable is $5,500). Is this going to be a problem? Would appreciate your thoughts on this. 1) You convert the rolled over money ($160) to Roth and pay taxes on $160. Next year, you can contribute the full amount of $5500 to IRA and convert it to Roth. Thankfully, rollovers and contributions are different and don’t interfere with each other. Hence, $160 will never interfere with your $5500 IRA contribution limit. 2)Convert the entire $5500 to Roth next year, leaving behind $160 plus it’s growth. Let’s say $160 is $300 next year at the time of conversion and when you move $5500 into Roth IRA, it becomes a tax deductible event in the sense that you still need to pay taxes on ($5500- $5500*($5500/$5800))= $284 out of the $5500 you are moving. 3) Convert the entire $5800 ($5500 + $300 [after the growth on $160]) to Roth next year. In this case, you pay taxes on $300 only. Hence, my suggestion is to do 1) right-away and forget about it. I think option 1 is best. I will do that right away. Thanks for your prompt reply. When taking the in-service distribution for the ATC and rolling it into the Roth IRA, how long does the money need to be in the Roth in order to be withdrawn penalty free? Does it have to season for 5 years as the TIRA to Roth IRA conversions? Thanks! Great question Dustin. There applies a 10% penalty on the part of distribution which you had to include on your income tax. This can be explained with an example. Let’s say I make $27,000 worth of ATC in 401K. At the time of rollover, the money has grown to $28,000. Now, $28,000 sits in Roth IRA. If I want to withdraw $28,000 out. I can but I will have to pay a 10% penalty on $1000, which is $100. If you wait for 5 years before withdrawing $28,000, you do not pay the $100 penalty. So, yes, you have to wait for 5 years but if you don’t, penalties are not as stringent as we think. Distributions of conversion and certain rollover contributions within 5-year period. If, within the 5-year period starting with the first day of your tax year in which you convert an amount from a traditional IRA or rollover an amount from a qualified retirement plan to a Roth IRA, you take a distribution from a Roth IRA, you may have to pay the 10% additional tax on early distributions. You generally must pay the 10% additional tax on any amount attributable to the part of the amount converted or rolled over (the conversion or rollover contribution) that you had to include in income (recapture amount). A separate 5-year period applies to each conversion and rollover. See Ordering Rules for Distributions , later, to determine the recapture amount, if any. The 5-year period used for determining whether the 10% early distribution tax applies to a distribution from a conversion or rollover contribution is separately determined for each conversion and rollover, and is not necessarily the same as the 5-year period used for determining whether a distribution is a qualified distribution. See What Are Qualified Distributions? , earlier. For example, if a calendar-year taxpayer makes a conversion contribution on February 25, 2016, and makes a regular contribution for 2015 on the same date, the 5-year period for the conversion begins January 1, 2016, while the 5-year period for the regular contribution begins on January 1, 2015. Unless one of the exceptions listed later applies, you must pay the additional tax on the portion of the distribution attributable to the part of the conversion or rollover contribution that you had to include in income because of the conversion or rollover. You must pay the 10% additional tax in the year of the distribution, even if you had included the conversion or rollover contribution in an earlier year. You also must pay the additional tax on any portion of the distribution attributable to earnings on contributions. Great post and great replies. I find the option 3 you discuss w ERN: rolling taxable gains back to the 401k a particularly good point — one I missed initially when I did my first conversion with gains (nearly the same #s as ERN). I instead opted to ay the tax and convert (option 1) but found it an expensive lesson. Than pay for the high cost to participate? Would your strategy change if you might use those funds earlier? There are two reasons I personally do a straight conversion to Roth. 1)I usually make my ATC with my year-end bonus check and maybe a couple of biweekly paychecks (we are allowed to contribute up to 75% of the bonus and pay from each check), hence the growth is not that much in a short time between when the contribution is made and when the fund is moved to Roth. 2) Yes, I am in my mid-thirties and I like the flexibility of having the funds in the Roth instead of the 401K, even though the marginal tax rate is high. The reason for preferring Roth is two-fold: (a) tax-free growth for many years to come (b) accessibility to the funds when really needed, without penalty. You would notice that when you move the growth from 401K to Roth, the growth is now primary contribution (principal) and can be accessed by you after 5-years of bake time without penalty. Had I left the growth in 401K, I would not have access to it without penalty (of course, there are some extenuating circumstances exceptions) until the retirement age of 59.5 years. Because I will be paying for college for my children, having the money in Roth instead of a taxable account or a 401K works better. 3)I am very close to 59.5 years of age.